No dogs are allowed on the beach, and no ATVs or unlicensed motorbikes allowed. If you would still like to enjoy the lake, you may walk the 1 km in from the main gate if conditions such as weather permit. The boat launch is not vehicle-accessible at this time. 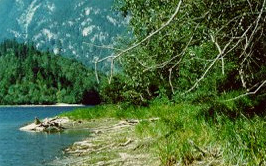 Situated in the scenic Skagit Valley, Silver Lake Provincial Park is a small, largely undeveloped lakefront area. Visitors can enjoy fishing, picnicking and boating (10hp motor limit) against a spectacular mountain backdrop or take pleasure in a rustic camping experience. These parasites live in tall grass and low shrubs, and seek out warm-blooded hosts. As potential carriers of disease, they should be avoided. Visit HealthLinkBC for more information on wood ticks and removal. The park is located 12 km southwest of Hope in the beautiful Skagit Valley. From the south: from Highway #1 watch for Silver/Skagit Provincial Park signs approaching Flood-Hope Road (Exit #168). Follow the blue park signs, turn right onto Flood-Hope Road, travel approximately 1 km to turn right on Silver Skagit Road. From the north: take either Exit #170 or #168 to Flood-Hope Road, and follow the signs to Silver Skagit Road. Travel this scenic route along the valley bottom, the first 2 km on pavement, the remainder on gravel. At 6 km watch for the park signs at a bridge on your right. Turn right and go over the bridge. It is 1 km in to the park. History: The park was designated to Provincial Park status in February 1964. Cultural Heritage: Silver Lake was a traditional First Nations fishing area. Conservation: The park lies within the Coastal Western hemlock, Douglas fir and western red cedar. The understory is characterized by ferns and mosses. Flowers, trees and shrubs are part of the park’s natural heritage. Please do not damage or remove them. Wildlife: The park provides habitat to small resident mammals such as squirrels, chipmunks and raccoons. Transient species include blacktail deer, black bear and a variety of birds. Steelhead, Dolly Varden and trainbow trout can be found in Silver Lake. Park users should always be aware of bears and other wildlife in our park environment. Never feed or approach bears and other wildlife. While Silver Lake is not included in the park boundaries, it provides excellent trout fishing opportunities. Catch and release only, single barbless hook, 10Hp motor limit for Silver Lake. Licences are available for purchase in Hope/Silver Hope Creek approximately 8 km away. Ice fishing is not recommended. Anyone fishing or angling in British Columbia must have an appropriate licence. There is only one short, 1km trail, which follows the west side of lake down an old road bed. There is lake swimming available; however, there is no roped off area. There are no wharfs or docks available. Drop offs occur. There are no lifeguards on duty at provincial parks. There is a 2 wheel drive accessible, single wide, gravel boat launch for small boats located near the day-use and campground areas. There is a parking area for vehicles and boat trailers; however, no overnight parking is available. Boats can be left in the water or beached overnight at owners own risk. 10Hp motor limit for Silver Lake. There are no docks or marina. Water skiing is not recommended. Campfires are permitted in the campground fire rings only. While campfires are allowed and campfire rings are provided at each campsite, we encourage visitors to conserve wood and protect the environment by minimizing the use of fire and using campstoves instead. Firewood can be purchased in the park or you may bring your own wood. Fees for firewood are set locally and may vary from park to park. Limited burning hours or campfire bans may be implemented. To preserve vegetation and ground cover, please don’t gather firewood from the area around your campsite or elsewhere in the park (this is a ticketable offence under the Park Act). Dead wood is an important habitat element for many plants and animals and it adds organic matter to the soil. There are two hand pumps available in the campground. Water is tested weekly and safe to drink unless posted otherwise. This park has a day-use/picnic area. There are no public shelters available. There is approximately 1 hectare of grassy area. There is a small rocky/sandy beach available. There are pit toilets, but no change houses. There are no campfires permitted in the day-use area and no barbeque facilities. The day-use area is available to foot traffic when gates are locked. This park has pit toilets located in the campground and day-use areas. There are no flush toilets or showers. There is one campground with 25 sites (3 double sites). There are no waterfront or pull-through sites. There is no service yard in this park. Firewood is available through the Park Operator when they drive through collecting camping fees, cash is the only form of payment accepted. The nearest pay phone is located in Hope, approximately 10 km away. Limited cell phone service may be available.